The Arca-Swiss Monoball Z1 tripod head commands a high price for several reasons. 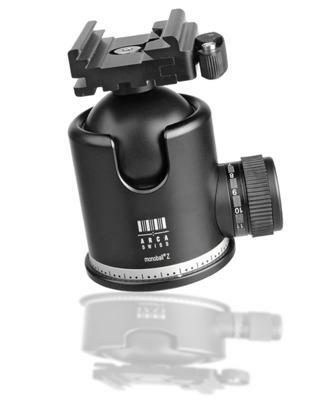 Arca Swiss has been known as a standard to follow when it comes to tripod ball heads. The Monoball Z1 weighs a light 1.5 lb (680g) and yet is able to hold 122 lbs (55.3 kg.) Yikes, it could hold my wife! One of its most unique features is that it has an elliptical ball inside. Normally with most ball heads, as the camera is tilted to more of an angle, the gravitational pull increases. This means you would have to increase the tension to hold the extra load. The Arca Swiss Z1's elliptical ball automatically compensates and gets tighter due to its unique shape. That alone makes it a candidate to be called the best tripod head available. Just like other top quality ball heads, the Z1 provides a drop-notch to use when you want to shoot vertically or downward at a steep angle. One great feature with the main knob is that the resistance scale is free floating. You can adjust how much resistance you want on a scale. Once you get the resistance set just right for your camera-lens combination, you are all set for that photo shoot no matter what angle you are shooting. The Arca Swiss does not need any routine maintenance and has a 5 year warranty. It comes with several single, double, classic, quick set, and flip lock options so you can get it just the way you want it. The "Z-Series" which replaced the Arca Swiss "B-Series" included new technical developments and optimized materials and coatings for superior performance to earn a best tripod head designation. The Arca Swiss Monoball Z1 is a big solid tripod head.